NHK NEWSLINE, April 21, 2018-- The US government has criticized North Korea over its human rights violations. 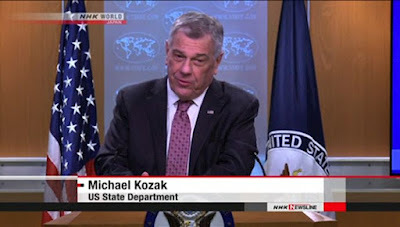 The annual report issued by the State Department also indicated Washington's willingness to pursue human rights together with the nuclear and missile issue. In its report released on Friday, the State Department highlights North Korea, China, Russia, and Iran as countries that violate human rights "on a daily basis". It says governments of those countries are forces for instability. Regarding North Korea, the document cites the alleged assassination of the North Korean leader's brother Kim Jong Nam and the executions of government officials and citizens. A senior State Department official in charge of human rights, Michael Kozak, said at a news conference that the United States is equally concerned by North Korea's nuclear development and the human rights question. The document also accuses China of intensifying its crackdown on citizens in the Tibet Autonomous Region and the Xinjiang Uygur Autonomous Region. Participants at Friday's news conference asked questions about US foreign policy issues including human rights under the administration of President Donald Trump.